Overview: The Mumbai Maternal Nutrition Project (MMNP, also known as Project “SARAS”, meaning “excellent”) is led by Dr Ramesh Potdar (insert image J), Centre for the Study of Social Change (CSSC), Mumbai, India. Other key investigators are Dr Sirazul Ameen Sahariah (insert image K), Mrs Meera Gandhi (insert image L) and Dr Harsha Chopra (insert image M), CSSC, Mumbai. Key collaborators are: Dr Giriraj R Chandak, Centre for Cellular and Molecular Biology, Hyderabad, and Prof Andrew Prentice and Dr Matt Silver, MRC The Gambia and London School of Hygiene and Tropical Medicine. 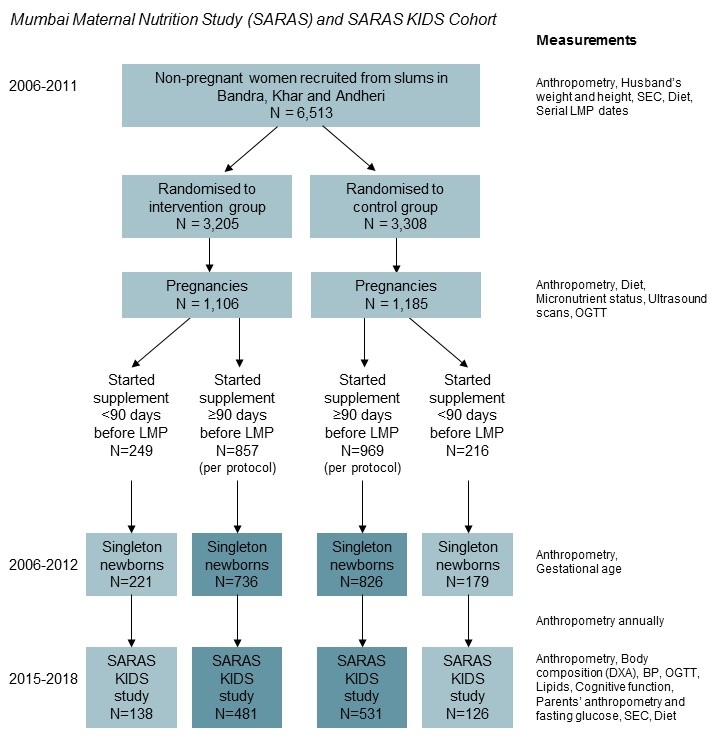 The Mumbai Maternal Nutrition Project (2006-2012) was a randomised controlled trial of a food-based supplement for women living in slums in the city of Mumbai. Supplementation was started pre-conceptionally and continued until delivery. The children born to these women have been followed up since birth (SARAS KIDS study) and during 2013-2018, body composition (DXA), a range of cardiometabolic risk markers and cognitive function were measured at the age of 5-8 years. Blood samples and buccal swabs were collected for DNA and have been used in the EMPHASIS study to assess effects of maternal supplementation on the child’s DNA methylation. The SARAS KIDS study has, along with other Indian birth cohorts, contributed data to ongoing GWAS studies looking for SNPs associated with newborn size and later cardiometabolic risk markers. Objective: To evaluate the effect of a maternal pre-conceptional food-based supplement on growth, body composition, cardiometabolic risk factors and cognitive function in the children, and to investigate DNA methylation as a potential mechanism linking maternal supplementation to these outcomes in the children. Methods: The intervention in mothers was a daily snack made from locally available micronutrient-rich foods: green leafy vegetables, dried fruit and milk powder, eaten in addition to the women’s habitual diet. Women in the control group received snacks made from foods of lower micronutrient content. 6,513 women were recruited between 2006 and 2011, and births were completed in 2012. From June 2013 to August 2018, body composition (DXA), cardiometabolic risk factors (glucose tolerance, insulin resistance and plasma lipids) and cognitive function (multiple domains, using a battery adapted for Indian children), were measured as the children reached the 5-8 year age window. The results are currently being analysed and will be available in late 2019.